Kids love these junior border patrol badge stickers. Watch as you hand them one for the smile you'll put of their face. Junior border patrol badge stickers are perfect for airports, community events, school functions, etc. Let us design a custom junior agent badge sticker for your agency that you'll be proud to give out. Junior border patrol badge stickers are printed on your choice of shiny Gold or Silver foil labels with Black or Dark Blue Ink. PoliceStickers.com is a family owned small business. We don't have setup charges, there's no extra charge for gold or silver foil, no extra charge to change any or all the words, no extra for a perforation between each sticker and no charge for an email proof after we receive your order. And our stickers are proudly printed in the U.S.A.
Stickers provided on Rolls of 1,000. Perforated between each sticker. 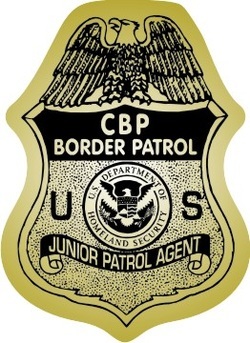 JUNIOR BORDER PATROL BADGE STICKER SIZE: #S1D = 2-1/4" x 3"